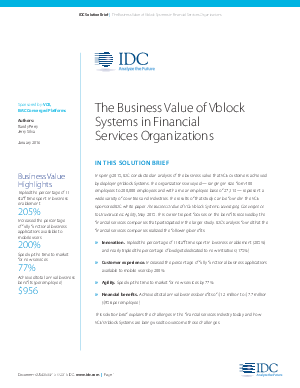 In the spring of 2015, the IDC organized a study on the business value Vblock systems bring VCE customers. The organizations that took part in this study ranged from 400 employees to 200,000 employees, with an average employee count of 27,113. These organizations represent a wide array of industries and countries. This report also identifies the challenges faced by financial services industry today and how VCE’s Vblock Systems are being used to address them.